America’s Best Days Are Ahead! I recently spoke at an event in Missouri, and I took the liberty to talk about why I believe America’s best days are ahead. In this speech, I hit on what I believe are the most critical problems and end with solutions that start with the people. Our best days are ahead if we the people will take ownership. We’ve heard it over and over, and it is now even being taught in some of our educational institutions. The Constitution is apparently no longer relevant and is even classified by some as downright evil. Here are my thoughts. What are yours? It wasn’t too long ago I was invited to debate Dr. John Ray, a professor at Montana Tech University regarding liberty and the U.S. Constitution. Can people discriminate on religious grounds? Should we have unlimited access to firearms? Is the Constitution a living, breathing document? Check out this great, vibrant exchange straight out of Butte. Montana. Parts 2, 3, and 4 can be found by clicking the following link: Shane Krauser’s YouTube Channel. In July 2012, I had the distinct honor and privilege to be invited by Glenn Beck to be a part of the Restoring Love event in Arlington, Texas. This attracted tens of thousands of people from all over the world, and it was certainly one of the highlights of my life. These videos capture just one of the many talks I gave during that monumental week. Enjoy! What is the most important battle going on in America and the world? As an intense as it might be, many might conclude that the political battle is of utmost importance. While tempers rage in the political arena, the cultural battle is quietly taking place. It’s always been this way. When all is said and done, politics is just a reflection of the outcome of the cultural battle. Will the Next Generation Cherish Freedom? We have every reason to be concerned for our future and whether they will carry on the fight for freedom. My experience as I have talked with thousands of high school and college students is one that many Americans would not necessarily be astonished by. Most of our young people don’t have a clue about the great American experiment that they are apart of. That’s the bad news. The good news is that once our children hear the “other side,” there is an awakening that takes place. Suddenly, these young people have the capacity to give us hope. They believe in America. They understand why limited government is essential to the freedom. Without question, our young people in this country hold the capacity to right this unconstitutional runaway train. There are few things I believe more strongly than this. So, how do we get there? I continue to hear the mantra that we want to get the young people involved, but we often wonder why they are missing in action. The answer is simple. We are not presenting them with those things that make it important to them. As far as young America is concerned, their initial impressions revolve around believing that cradle to grave security provided by big government is just fine. And society hasn’t really taught them anything different. Think about the following questions, followed by some typical responses of our young people. 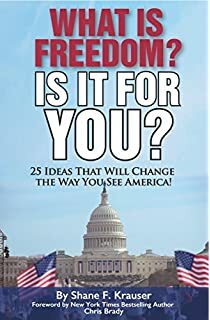 I am convinced that our young people don’t understand the “why” of America because we’ve spent so much of our time in civics just teaching them about the “what” and the “how.” Of course, human beings buy the “why” and they couldn’t care about much less, at least at the inception of the sales or learning process. How about letting our children experience events like the 1776 crossing of the Delaware, for example? In my own family, we celebrate that historical event by jumping into a “cold” pool or running barefoot through the snow on Christmas Eve, which is the time frame of this pivotal battle. And why is this event so important? Because 1/3 of our soldiers had no shoes, they believed in the intangible of freedom, and we’re willing to fight for it even if it was unpopular or uncomfortable. The rising generation must experience this, and my own children have a deep sense of appreciation for the founding generation because of these emotional teaching moments. The idea of America must first touch their hearts before they’ll contemplate it seriously in their minds. There is something refreshing about watching Americans wake up, especially when you make freedom and an overbearing government up close and personal. We can make these things relevant one step at a time. And then we can discuss limited government. Now, we can discuss why we cannot allow power to be concentrated into one branch of government. Now we can discuss what it truly means to be free. We have a lot of work to do, but I am convinced that, as we build relationships with the future of America, the tide will quickly shift. Not only do I believe this. I know it. Experience is an incredible master.